Moms, take note: You may actually get a taste of lazy beach days at Mother’s Beach, what with the small, safe waves, the innovative playground and family-friendly vibe. 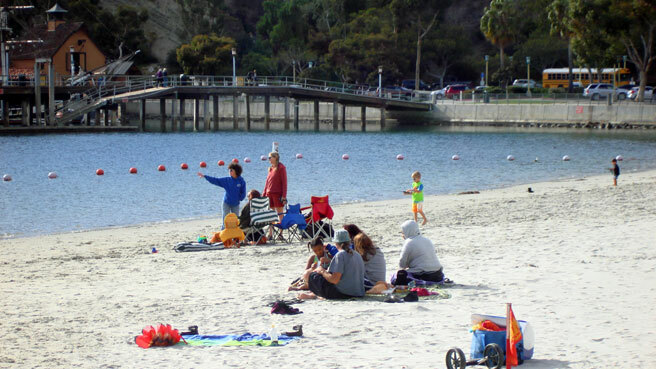 While you’re busy relaxing (as much as a parent can), babies, toddlers and kids alike can keep themselves busy in this secluded bay of Long Beach. Atmosphere: Families with young children rein here, and involved parents (and lifeguards) seem to keep kids in line. Mother’s Beach is in the “nice” part of Long Beach, and surrounded by expensive homes and open space for play and picnics. Parking and Entrance: Park in one of the metered spots ($1 per hour) in the parking lot just off the sand. Meters shut off at 4 p.m., and limited street parking is available. 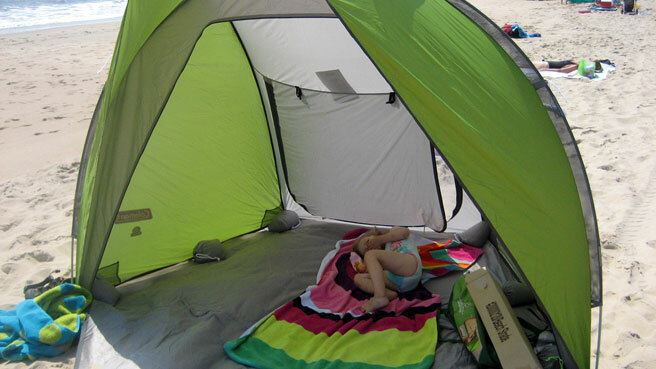 The lot is at sea level so you’ll be able to push a stroller right onto the beach. There are many parks in the area, so put “Marine Park” into your GPS. Mother’s Beach is near the intersection of Appian Way and 2nd Street, and you might accidentally get directed to Marina Vista Park. Nice Walks and Views: Walking paths abound throughout the marina, but none are within walking distance of Mother’s Beach. 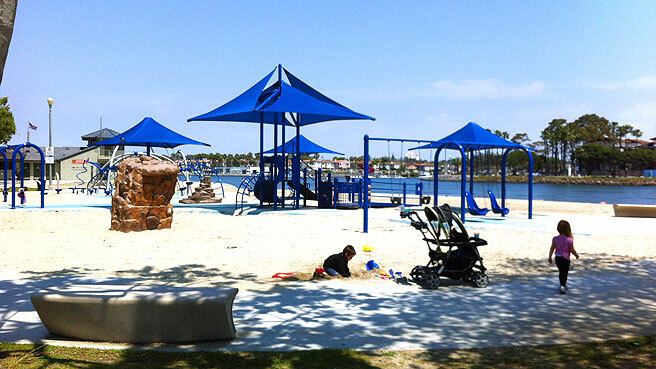 Check out Marina Vista Park for another playground, tennis courts, and wide-open marina views. Activities for Toddlers: The Mother’s Beach playground (called Marine Park) is about 20 feet from the sand, and it suits all ages. Some of the unique and exciting features: sand digging tools, an arm-powered bike, older-kid obstacle course with climbing spider web, water play area, shaded jungle gyms and full-back swings for special needs kids or breastfeeding moms. Of course, the waves here are very small and great for little kids ready to brave the ocean. Watch out for water quality advisories as watercraft also use the area. Bathrooms: Rows of bathrooms with chemical toilets are north of the playground. 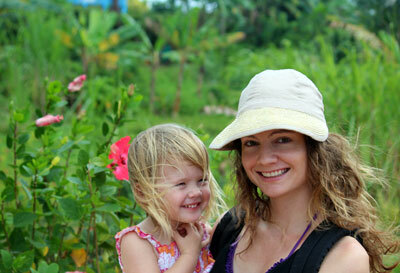 Perks for Parents: Rent a boat in the marina or watch dragon boat practice, popular there. Where to Stay with Kids: Stay in central Long Beach at the Residence Inn Long Beach Downtown (not within walking distance of Mother’s Beach, but right on the waterfront). The all-suite hotel’s rooms come with full kitchens and pullout sofas. Baby-friendly Restaurants: There are quite a few restaurants along East 2nd Street in the Naples area of Long Beach, but a local diner-style option is The Small Café. Good burgers and good prices. What Else to Do: You’re most likely visiting Long Beach to see the Aquarium of the Pacific, tour Queen Mary, or to sail out of the port to Mexico or Catalina.